. Last edited 14:54 13 Feb 2019. The global market is starting 2019 soft, with the JKM Feb-19 contract expiring at 8.8 $/mmbtu, compared to the 11.2 $/mmbtu at which it sat this time last year. The much-anticipated supply waves of LNG finally seem to be crashing on the market shore, despite the best efforts of still surprisingly strong Chinese demand. While the NE Asian winter has been mild thus far, much of the global softening in prices has come from the supply side. Some 32 Mtpa of new liquefaction capacity came online in H2 18, but even then, 18 Mtpa of those trains only started exports in December 2018 (Corpus Christi T1, Yamal T3) or were looking to start in January 2019 (Sabine Pass T5, Prelude FLNG). An increasing proportion of new volumes are starting to come from the US, with 19 Mtpa of new US trains expected to come online in 2019. All of this new liquefaction capacity leads to our supply forecast of some 30.8 Mtpa of incremental LNG supply over 2019. While softening prices have allowed some countries to return to the tender markets, the main beneficiary of the robust supply side so far has been Europe—the sink that absorbs volumes not needed elsewhere in the world. 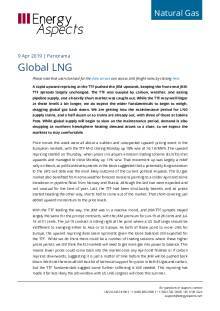 Over Q4 18, NW Europe’s LNG facilities received 4.2 Mt more LNG y/y. The increase has continued in January, with terminal receipts up by some 2.2 Mt y/y over the month. We expect that Q1 19 imports will be 8.1 Mtpa higher y/y, and 2019 total imports higher y/y by 24 Mt. While there is an analytical consensus that 2019 will see a raft of new supply, we think that only five planned projects will actually take an FID this year. However, that handful of projects equates to a chunky looking headline capacity number of 74.5 Mtpa. Almost half of that (33 Mtpa) is part of Qatar’s plans for four mega-trains that seem almost certain to take an FID by year-end and start coming online from 2023 at earliest. Much of the remainder (26 Mtpa) is at US projects led by Cheniere (Sabine Pass T6), Venture Global (Calcasieu Pass) and Tellurian (Driftwood). While JKM prices have slid, the crowding-out impact of higher prices that has come with meeting Chinese demand in the last two years should be less important. Given that, 2019’s lower LNG prices could well be a year where we see a reignition of demand-side interest. At the moment, though, it is hard to see where new gas demand in 2019 might actually come from outside of south Asia. And while we are supportive of South Indian takes, the region has infrastructure issues that could limit any potential upside to our forecast of a 7 Mt y/y import increase. 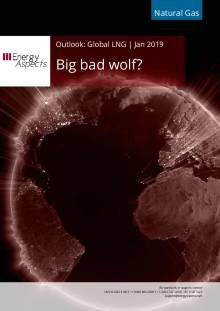 Europe will hold the key to global gas price direction this year. The influx of LNG cargoes into Europe has already resulted in LNG prices slipping to the lowest, on a relative basis (given coal and carbon prices), that we have seen for years. Despite this, we still think there is further softness to come if Europe is going to stimulate additional demand to absorb the extra LNG we expect to arrive. The exact TTF flat price will depend on where European coal and carbon prices go—we are bullish both from current levels—which is possibly the only support the market will get. This suggests that the TTF market will get plenty of gas into power around the 19–20 €/MWh (6.4–6.8 $/mmbtu) price level. Given loose global balances, we expect the JKM will only need to trade at a thin premium to the TTF, pushing NE Asian prices down towards those levels.